One in six primetime television viewers use social media simultaneously, whether it is related to the show that they are watching or not. A recent study by the Council for Research Excellence (CRE) sampled 1,665 respondents in late 2013 and found radical increases in social TV statistics from a study carried out earlier in 2013 by Deloitte. The CRE study focused on second screen behavior and the sharp increase in using social media while viewing TV programs forecasts an even steeper rise in 2014. The info-graphic below portrays a breakdown of these users activities. Of the 16% of television audience using social media at the same time, about half (7%) is engaging in social media related to the programming that they are watching. 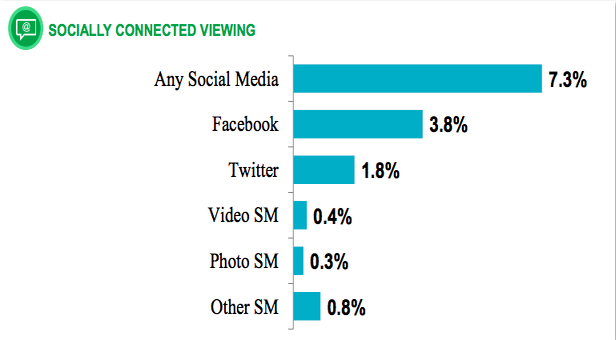 There are actually more viewers who are engaging in non-show related social media. This report found that Facebook is the primary platform used in the second-screen social media experience, almost doubling the frequency of Twitter in the behavior. 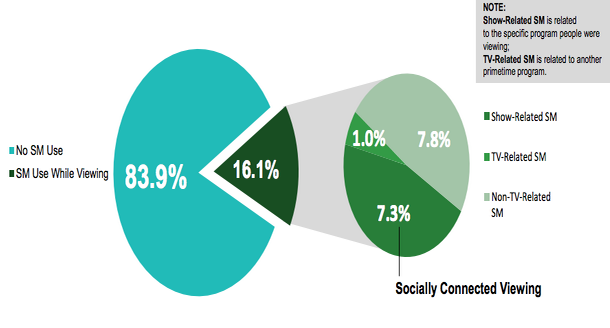 However, Twitter is the leading platform for program related, second-screen social engagement. A study in early 2013 found that more than 90% of online conversations about TV are on Twitter. 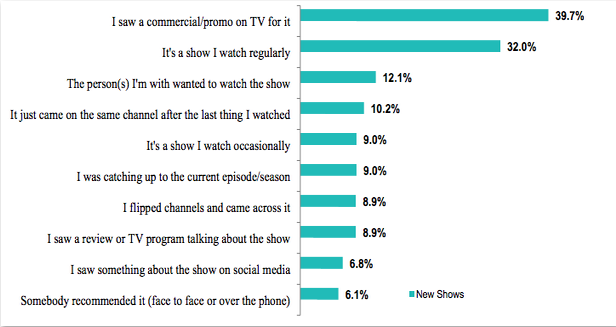 Despite the rising presence of social media in the TV viewing experience, traditional TV promotions are still more influential and effective in recommending new shows to viewers than social media ads. This entry was posted in Industry News and tagged Facebook, infographic, second-screen, social, social media, social tv, SocialTV, television, tv, twitter by Lindsay. Bookmark the permalink.